(a) Remove the 2 bolts and separate the rear disc brake caliper assy LH. HINT: Do not disconnect the flexible hose from the disc brake caliper assy LH. (a) Release the parking brake, and remove the rear disc. HINT: If the disc cannot be removed easily, turn the shoe adjuster until the wheel turns freely. (b) Place machmarks on the rear disc and the axle hub. (c) Remove the rear disc. (a) Using a brake drum gauge or equivalent tool, measure the inside diameter of the rear disc. 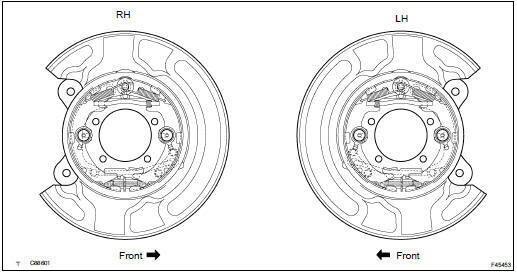 If the inside diameter exceeds the maximum, replace the brake disc. (a) Using needle-nose pliers, remove the 2 parking brake shoe return tension springs No.1. 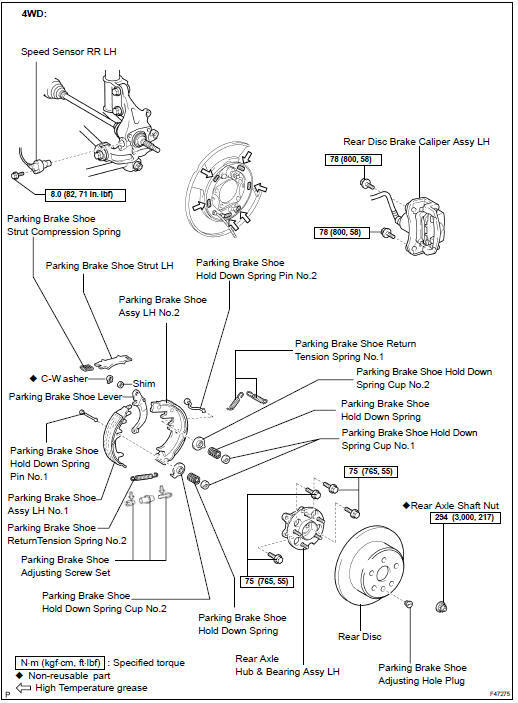 (a) Remove the parking brake shoe strut LH and the parking brake shoe strut compression spring. (a) Remove the parking brake shoe hold down spring cup No.1, parking brake shoe hold down spring and parking brake shoe hold down spring cup No.2. (b) FF: Remove the parking brake shoe hold down spring pin No.1. (c) Disconnect the parking brake shoe return spring No.2 and remove the parking brake shoe assy LH No.1. (a) Remove the parking brake shoe adjusting screw set. (b) Remove the parking brake shoe return tension spring No.2. (a) Remove the parking brake shoe hold down spring cup No.1, parking brake shoe hold down spring, parking brake shoe hold down spring cup No.2 and parking brake shoe hold down spring pin No.2. (b) Remove the parking brake shoe assy LH No.2. (c) Using needle-nose pliers, disconnect the parking brake cable No.3 from the parking brake cable shoe lever. NOTICE: Be careful not to damage parking brake cable No.3. (a) Remove the parking brake shoe hold down spring pin No.1. (a) Using a screwdriver, remove the C-washer. (b) Remove the shim and parking brake shoe lever from parking brake shoe assy LH No.2. (a) Using a ruler, measure the thickness of the shoe lining. If the lining thickness is less than or equal to the minimum, or if there is severe or uneven wear, replace the brake shoe. (a) Apply chalk to the inside surface of the disc, then grind down the brake shoe lining to fit disc. If the contact between the brake disc and the shoe lining is improper, repair it using a brake shoe grinder or replace the brake shoe assembly. (a) Using a feeler gauge, measure the clearance. If the clearance is not within the specifications, replace the shim with one of the correct size. (b) Using pliers, install the parking brake shoe lever LH and the shim with a new C-washer. (a) Apply high temperature grease to the shaded parts shown in the illustration of the backing plate which make contact with the shoe. (a) Install the parking brake shoe hold down spring pin No.1. (a) Using needle-nose pliers, connect the parking brake cable No.3 to the parking brake cable shoe lever. NOTICE: Be careful not to damage the parking brake cable No.3. (b) Install the parking brake shoe assy LH No.2 with the parking brake shoe hold down spring, parking brake shoe hold down spring cup No.1, parking brake shoe hold down spring cup No.2 and parking brake shoe hold down spring pin No.2. (a) Apply high temperature grease to the parking brake shoe adjusting bolt and piece. (b) Attach the parking brake shoe return tension spring No.2 to parking brake shoe assy LH No.1 and parking brake shoe assy LH No.2. (c) Attach the parking brake shoe adjusting screw set to the parking brake shoe assy LH No.1 and parking brake shoe assy LH No.2. (a) FF: Install the parking brake shoe hold down spring pin No.1. (b) Install the parking brake shoe assy LH No.1 with the parking brake shoe hold down spring, parking brake shoe hold down spring cup No.2, parking brake shoe hold down spring cup No.2. 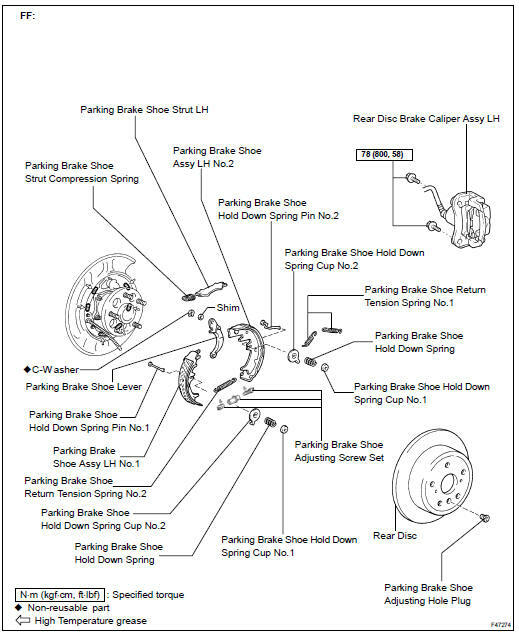 (a) Attach the parking brake shoe strut LH and the parking brake shoe strut compression spring to parking brake shoe assy LH No.2 and parking brake shoe assy LH No.1. (a) Using needle-nose pliers, install the 2 return tension springs No.1 as shown in the illustration. HINT: First install the front side spring then the rear side spring. (a) Aligning the matchmarks, install the rear disc. (a) Temporarily install the hub nuts. (b) Remove the hole plug, turn the adjuster and expand the shoes until the disc locks. (c) Contract the shoe adjuster until the disc rotates smoothly. Standard : Return 8 notches (d) Check that the shoe has no brake drag. (e) Install the hole plug.